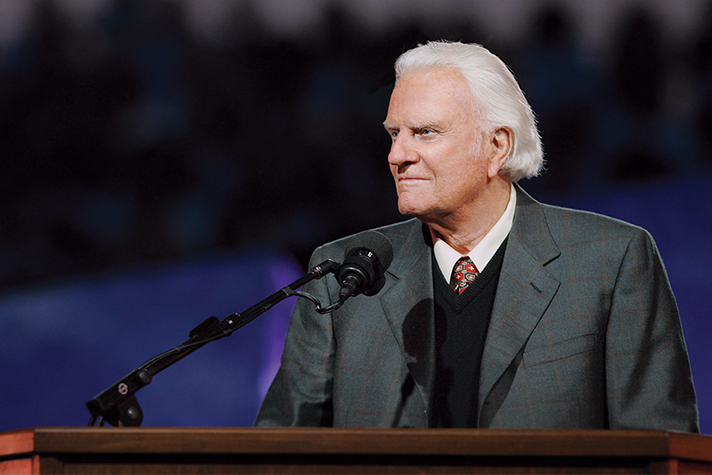 The Greater New York Billy Graham Crusade, in June 2005, was Billy Graham’s final Crusade, although he preached later at two Franklin Graham Festivals (New Orleans and Baltimore). The following sermon, preached on the final night of the New York Crusade, carried the same message that Mr. Graham proclaimed throughout his nearly 80 years of ministry: We are all sinners, but God loves us and will forgive us when we turn from our sin and by faith put our trust in Jesus Christ. Almost everyone today understands that we are approaching a climactic moment in history. The world is going to come to an end. In the New Testament the new birth is mentioned nine times. Repentance is mentioned 70 times. Baptism is mentioned 20 times. The coming again of Christ is mentioned hundreds of times. Jesus Christ said that as the days of Noah were, so shall also the coming of the Son of Man be. When the situation in the world becomes the way it was in Noah’s day, you can know that Jesus’ return is near. In Noah’s day the world was filled with wickedness, corruption, violence—every imagination of man’s thought was evil. It was a world in which marriage was abused and violence prevailed. Think of the headlines of our papers today. All of that is happening today, and I believe that today God is warning us. Noah was a good man. The Bible says he walked with God. He was a man of moral integrity. He worshiped God. The Bible says by faith Noah, being warned by God of things not yet seen, moved with fear. People ask, “Is it legitimate for a person to come to Christ out of fear?” Absolutely. Many people in the Bible came to God because of fear. But God is a God of love. The primary message about Jesus in the New Testament is that God loves you. Some of you feel unloved. Some of you feel depressed, or you feel you don’t have purpose and meaning in your life. God is there to rescue you from that situation. If you repent, He will forgive your sins, because when Jesus died on the cross God laid on Him the sins of all of us. It would be great if you could go home tonight and know that you’re different, that you have a new strength with God, by faith in Christ. 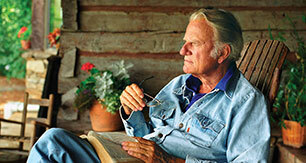 When I read the news today, the only bright spot I see on the horizon is the return of Christ. I believe He is coming back. In the New Testament there are so many passages about the coming again of Christ. I could spend all afternoon reading them. Jesus said, “I go to prepare a place for you. And if I go and prepare a place for you, I will come again and receive you to Myself; that where I am, there you may be also” (John 14:2-3). If I died right now—and that’s a possibility—I’d go straight into Heaven and see Jesus. Most of the interviews that I’ve had here in New York have asked the same questions about death—“What happens when you die? Are you looking forward to death?” Yes. I’m looking forward to death. We are going to die. We’re all under judgment. War does not increase death. Did you know that? Think about it. Some may go a little quicker than others. Thousands of people were killed when the Allies invaded Europe in 1945 at Normandy. And thousands of people have died in Iraq, Vietnam, Korea and many other places. But that does not increase death, because we are all going to die; we’re going to join them in death. But when we die, we’re going to be divided. Some will be eternally lost and some eternally saved. We are saved through Jesus, if we put our faith in Him. Jesus loves us, and He went to prepare a place for us. When Christ was ascending into Heaven following His death and resurrection, the angels asked His disciples, “Men of Galilee, why do you stand gazing up into heaven? This same Jesus, who was taken up from you into heaven, will so come in like manner as you saw Him go into heaven” (Acts 1:11). Jesus is going to come back. Are you ready? Now when is that going to happen? When Jesus and the disciples met together, the disciples asked, “‘Lord, will You at this time restore the kingdom to Israel?’ And He said to them, ‘It is not for you to know times or seasons which the Father has put in His own authority’” (Acts 1:6-7). He also said, “But of that day and hour no one knows, not even the angels of heaven, but My Father only” (Matthew 24:36). But the Scripture says, “For the Lord Himself will descend from heaven with a shout, with the voice of an archangel, and with the trumpet of God. And the dead in Christ will rise first” (1 Thessalonians 4:16). There’s going to come a day when you’ll hear a gigantic noise from Heaven, a shout, and then the archangel is going to speak. At that moment, those who have died—your fathers, your mothers, your relatives, your friends who are dead in Christ—are going to rise from the dead. For years, every time I would come to New York, I would pass a graveyard on the way to Times Square. I don’t know the name of it, but there are graveyards all over New York. And those graves are going to be opened, if they are people who knew Christ as their Lord and Savior. And we’re going to join them. Those of us who are left here, who are still living, are going to join them in the air on our way to Heaven. Then the Bible teaches us that there’s going to be a great coronation, with millions of angels. Thousands of people who have followed Christ in their life here on earth are going to have a gigantic banquet called the Marriage Supper of the Lamb. Jesus is the Lamb. He’s going to be crowned King of kings and Lord of lords, and what a glorious moment that will be. I’m looking forward to that. In fact, George Beverly Shea, whom you just heard sing “How Great Thou Art,” is 96, and I’m 86, on my way to 87. I know that it won’t be long before both of us are going to be in Heaven. Jesus said, “Therefore you also be ready, for the Son of Man is coming at an hour you do not expect” (Matthew 24:44). The Bible says, “Prepare to meet your God” (Amos 4:12). Are you prepared? Have you opened your heart to Jesus? Have you repented of your sins? Open your heart to Jesus today.